FORT BRAGG, N.C. — Sgt. Bowe Bergdahl, who walked off his base in eastern Afghanistan in 2009, setting off a huge military manhunt and a political furor, pleaded guilty on Monday to desertion and to endangering the American troops sent to search for him. The guilty pleas by Sergeant Bergdahl, a 31-year-old Idaho native now stationed at an Army base in San Antonio, Tex., were not part of any deal with prosecutors. It will be up to an Army judge here at Fort Bragg to decide the sergeant’s punishment, following testimony at a hearing that is scheduled to begin next week. The desertion charge carries a potential five-year sentence, and the charge of endangering troops — formally known as misbehavior before the enemy — carries a potential life sentence. In a military courtroom here on Monday morning, Sergeant Bergdahl stood before the judge, Col. Jeffery A. Nance, and described his actions as inexcusable. “You just walked away?” Colonel Nance asked him. Sergeant Bergdahl has previously said that he had intended to walk from his unit’s outpost to a larger base about 18 miles away, in order to report what he felt were leadership problems in his unit. He said he wanted to cause a major stir, to ensure that he received an audience with a high-ranking officer. But he told Judge Nance on Monday that he never meant to set off the manhunt that followed his disappearance. His decision to plead guilty appeared to reflect the impact of victories by Army prosecutors over the last year. They include rulings by Colonel Nance to allow the case to go forward despite inflammatory statements on the campaign trail by President Trump, and to allow prosecutors to introduce evidence of grievous injuries suffered by service members who, the judge ruled, were searching for the sergeant at the time. Sergeant Bergdahl was captured by Taliban militants within hours of disappearing from his remote outpost, and was held captive for five years. He endured torture, including beatings with rubber hoses and copper cables, that his military debriefer later characterized as the most profound abuse sustained by any American service member since the Vietnam War. He was released in May 2014, when the Obama administration freed five detainees from Guantánamo Bay, Cuba, in exchange for him. His case soon turned into a politically charged referendum in Washington on the Obama administration’s foreign policy. After he was freed, President Obama’s national security adviser, Susan Rice, said Sergeant Bergdahl, who was promoted while in captivity, had served with “honor and distinction,” and Mr. Obama appeared with his parents at the White House. But Republicans attacked the trade that led to his release, and some critics asserted that he had deserted to the Taliban or that some troops had died searching for him. During the presidential race last year, Mr. Trump also described the sergeant a “dirty rotten traitor” and called for him to be executed. At a preliminary hearing, the Army’s chief investigator, Maj. Gen. Kenneth Dahl, testified that he had found no evidence that any soldiers had been killed while specifically searching for Sergeant Bergdahl. Neither was there evidence that the sergeant intended to desert and join the Taliban, he said. Sergeant Bergdahl’s defense team later argued that Mr. Trump’s comments made a fair trial impossible, since everyone who could play a role in deciding his fate — including prosecutors, the judge and the general who controls the case — now ultimately reports to Mr. Trump as commander-in-chief. But Colonel Nance concluded that while Mr. Trump’s comments were “disturbing,” there was no reason to dismiss the charges. 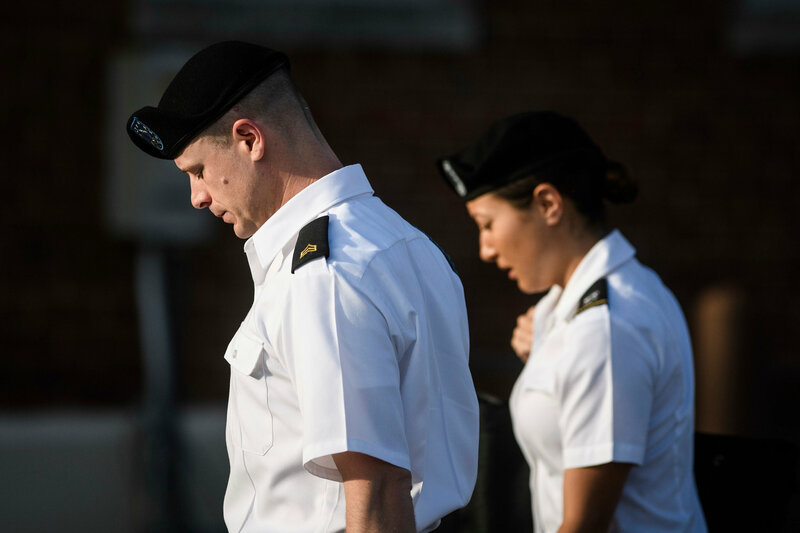 Army prosecutors say that Sergeant Bergdahl’s departure from the outpost forced the military to drastically alter its operations and strategy during the manhunt, hurting the war effort. And they will present evidence of the serious wounds suffered by searchers, including Master Sgt. Mark Allen of the Army and Senior Chief Petty Officer Jimmy Hatch, a Navy SEAL. Sergeant Allen was shot in the head during a firefight a little more than a week after Sergeant Bergdahl disappeared. He now uses a wheelchair and is unable to speak or care for himself. During a separate mission around the same time, Chief Hatch suffered a leg wound that required dozens of surgical procedures and an agonizing recovery. Defense lawyers argue that those injuries cannot be directly tied to Sergeant Bergdahl. They have cited a military investigation that found grave faults with the planning of the mission that left Sergeant Allen wounded, and evidence that they say indicates that Chief Hatch was injured on a mission that “targeted a well-known enemy combatant,” a purpose apart from rescuing the sergeant. The sergeant was later found to have suffered schizotypal personality disorder in the period when he walked off his base in Afghanistan.